As the "End of Life" date for Windows 7 grows ever closer, are you ready to move from a tried and tested operating system to the brave new world of Windows 10? Whether your environment is 20 or 2000 there is a level of consideration that must be given to understanding what you currently support, from an application and functional perspective. As knowing what you will need to keep your business running is key to surviving the migration. You need an understanding of the impact that the perpetual development and release life cycle of Windows 10 will have on your approach to ongoing support, control of your standard image and strategy for updating and patching, to ensure that support costs do not escalate. You will need to design a fresh build or set of builds that can be deployed efficiently and satisfies the ongoing requirements of your business, ensuring that downtime during the migration is minimised and data is protected. Join us for an informative web session, hosted by Quest Software, to learn how KACE has the power to help you plan, design and implement a standardised Windows 10 environment. It’s time once again for Educause, which is taking place in October 31 – November 1, 2018, at the Colorado Convention Center in Denver Our team of experts will be there to talk through some of the endpoint management challenges you’re facing in the education sector. Endpoint visibility – With Bring Your Own Device (BYOD) and Internet of Things (IoT), getting a line of sight into what endpoints are on your network from servers to Windows-based computers, Mac-based computers, Chromebooks, mobile devices and a wide array of connected, non-compute devices, is a challenge. Endpoint security – For every device that connects to your network, there is likely someone out there trying to exploit that connection to access your institution’s data via malware, ransomware and other methods. Summer reimaging projects – Aside from migrating to Windows 10, most schools need to reimage their endpoints every summer to get ready for new students arriving for the next school year, which is costing you valuable time and resources. 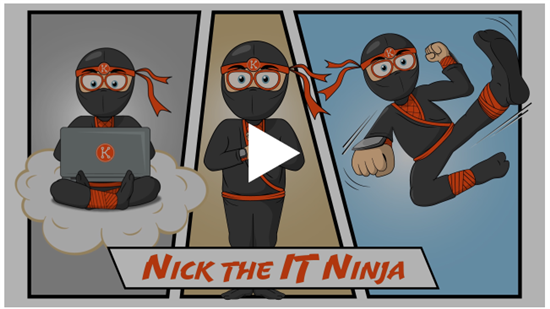 Check out the Nick the IT Ninja video to get a sneak preview on how you can become an IT Ninja with KACE. Come to the stand and take a pic with Nick to get your limited edition Nick the IT Ninja T-shirt. You can also get your hands on some bouncy balls and other cool Quest swag. You will also have a chance to speak with KACE product experts and address any challenges that you are facing around endpoint management, as well as get an in-depth view of how KACE can help you address these issues and save you time. We understand that time, resource and budget is precious. To help with challenging budgets, we have a special pricing promotion to help you address endpoint challenges that’ll give you room to grow as your educational institution’s headcount increases, regardless of whether you need 5,000 or 15,000 licenses — the license cost remains the same. KACE Systems Management Appliance (SMA) automates complex administrative tasks, making it possible for you to inventory all hardware and software, patch mission-critical applications and OS, reduce the risk of breach, and assure software license compliance. KACE Systems Deployment Appliance (SDA) makes it possible to quickly and easily automate large-scale system deployments while simplifying migrations of multiple operating systems. Looking forward to seeing there!!! KACE training is free with your active support contract! Check in regularly as we continue to add more courses. To access the globally-available English courses, visit the Quest Support Educational Services page and select the product(s) for which you have maintenance from the drop-down product list. Look for listings that say “Free” at the end of the title. Click here fora complete catalog.